The First Karmapa, Dusum Khyenpa Chökyi Drakpa was born in Tresho, Kham, in 1110 and was given the name Gepel. His father, a Yamantaka practitioner, gave him instructions in the Nyingma Vajrayana traditions. 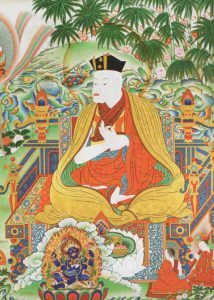 When Dusum Khyenpa was sixteen, he took novice ordination in the Kadam tradition and entered a two years of retreat at Treka Drak. There he studied and practised Chakrasamvara and other tantric lineages of Atisha. 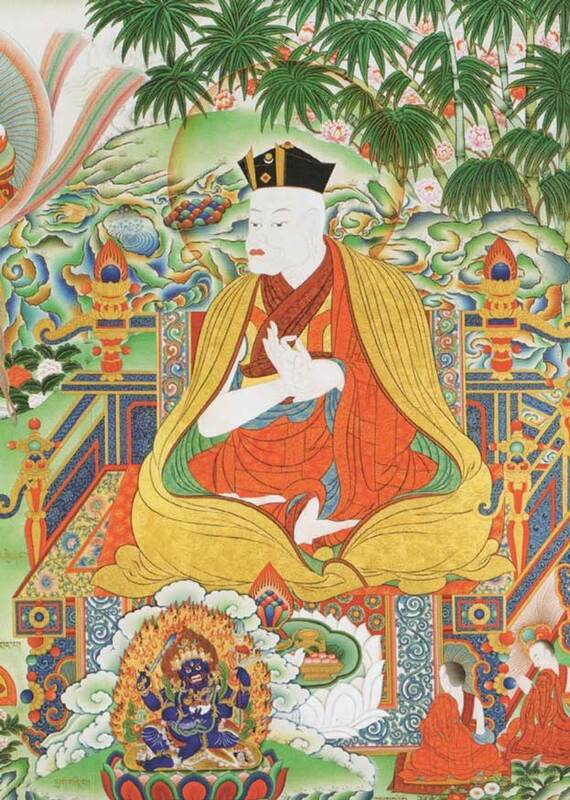 It is said that when Dusum Khyenpa was sixteen he was given a black hat woven from the hair of ten thousand dakinis, invisible to the ordinary eye. A physical replica was given to the Fifth Karmapa by the Ming Yung Lo Emperor of China. The Karmapas are usually depicted wearing the Black Hat in thankas and statues. At the age of nineteen he went to U-Tsang, where he received Kadampa teachings on logic and Madhyamaka and took final ordination. He then studied with a number of different masters in various monasteries, receiving the Mahakala tradition later known as the Gonpo Karluk, the Kalachakra teachings of the Jor Druk and further teachings on Madhyamaka. At the age of thirty Dusum Khyenpa set out to meet Gampopa Sonam Rinchen. On the way he stayed at Dakpo Draka, where he received teachings from Gomtsul and Sharawa Yonten Drak. He then proceeded to Dakpo Gompa and requested teachings and transmissions from Gampopa. Donning the white cotton robe of Milarepa’s tradition, he trained in the inner yoga of tummo for nine months. Having demonstrated great signs of accomplishment, Gampopa sent him to Zangri to continue his meditation. There, he practised diligently for four months in a cave named Til, after which he continued for six weeks at Pakmodru, before returning to study with Gampopa for another three years. Dusum Khyenpa then trained with Milarepa’s own disciple Rechung Dorje Drak and a number of other masters belonging to the budding Kagyu tradition. From these lamas he received the full transmission of Gampopa’s teachings; in particular his blending of Vajrayana practices such as Mahamudra, Chakrasamvara, Hevajra and the Six Yogas of Naropa, with the approach derived from the Kadam tradition of Atisha. Dusum Khyenpa spent the next several years meditating and deepening his experience in caves in southern and Central Tibet and Bhutan. Periodically he would return to report his progress to Gampopa. At one point he met a disciple of Naropa, who gave him additional Mahamudra instructions. Gampopa passed away when Dusum Khyenpa was about fifty years old, and, following some last advice that he should return to meditate at Kampo Nenang, he returned to Kham. There he founded the monastery of Kampo Nenang, in 1164. He had previously founded Karma Gön, the first seat of the Karma Kagyu tradition, which remained an occasional residence of Karmapas until the twentieth century. Dusum Khyenpa spent twenty years in Kham, after which he returned to central and southern Tibet. In 1189 he founded Tsurphu Monastery to the west of Lhasa, which became the principle seat of the Karmapa incarnations. His extraordinary accomplishment in meditation gave him the siddhi of vast extrasensory perception, meaning that he was able to know all of the details of the past, present and future existences of any sentient being. It was for this reason he became known throughout Tibet as Dusum Khyenpa: ‘the knower of the three times’. This is a quality and a title that has been attributed to all of the subsequent Karmapas and one that continues today. Dusum Khyenpa is also famous for having made predictions about his future incarnations; the first example of a tulku tradition in Tibet. He is said to have given a letter to his main disciple, Drogon Rechen, foretelling where his next incarnation (Karma Pakshi, the Second Karmapa) would be born and giving instructions for locating and training the child. Thus began the line of the Karmapas.